Braids can vary from the simple ones to those that are a bit complicated. Explore the article and get information about the different types of braid hairstyles. In many countries, braiding is the traditional way of stylizing the hair. Best suited for mid-length to long hair, braids are done in a variety of ways, both simple and complicated. There are broadly two methods used to weave the strands - the left-over-middle and right-over-middle and the left-under-middle and right-under-middle technique. The number of segments of hair may vary from the basic three to seven, increasing as per the intricacy of the hairstyle. In this article, we have provided information on different types of braids. English braid is a traditional hairstyle, popular amongst the women in the Great Britain since a very long time. This is a very simple, three-strand plait hairdo. After combing the hair toward the nape of the neck, it is divided into three equal segments. A simple left-over-middle and right-over-middle action is used to make the braid. French braid makes use of an extra segment of hair. 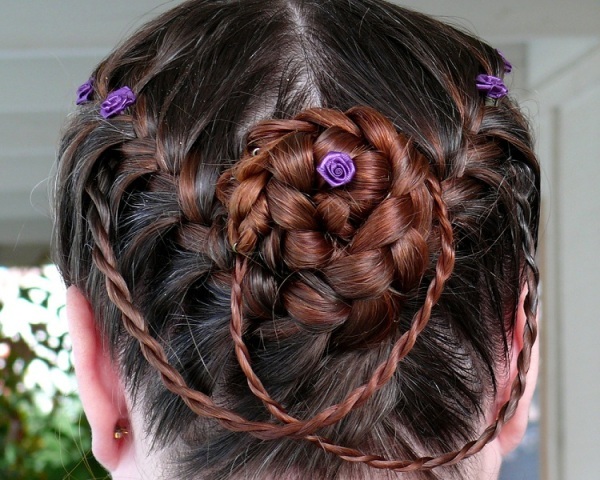 In this popular hairstyle, a technique similar to the English braid is used to stylize the hair. While doing the French braid, one section of hair is taken from the hairline at the forehead and two sections are taken from either side of the head, to make the braid. When you make the plaits, make sure that the hair is not braided too tightly. Dutch braid is the inverted form of the popular French braid. The Dutch braid is made by crossing the outside strand of hair under the center strand, which is known as the left-under-middle and right-under-middle technique. This hairdo should also be done by taking strands from either side of the head. While making the Swiss braid, the hair is divided into two halves, by parting it centre, right down to the nape of the neck. The left-hand side segment of the hair is braided into simple three-strand plaits. After securing the ends with an elastic band, the braid is taken on to the left side and curled around the head, up past the right ear and back to where it started. The right-hand hair segment is braided in the same form and is curled in the opposite direction. They are then joined around the head and pinned to form a kind of crown. It is very simple to make rope braids, although the hairstyle looks complicated. The braids are made with wet hair, preferably. To start with, the hair is pulled back into a ponytail. After securing it with an elastic band, the ponytail is divided into two strands. Now, each of the segment is twisted clockwise to give the appearance of a rope. The right section of the hair is wrapped counter clockwise over the left hair segment, tightly. You repeat the process until the end of the ponytail is reached. The number of strands used in multi-strand braid hairstyle ranges from five to nine. The complicated hairstyle should be done with a lot of patience, since it is hard to keep the hairdo neat. The technique used to make multi-strand braid is the simple left-over-middle and right-over-middle.